I absolutely love making homemade pizza. Once I really got the hang of this easy pizza dough, it really does feel like a quick and low fuss dinner. The beauty of homemade pizza is that I can add toppings that most pizza places in Chicago don’t offer. Have you ever had cream cheese on your pizza? It’s all the rage in my college town (Lawrence, KS) and it is absolutely the best idea anyone ever had for pizza! I used to make pizza dough the traditional way where you let the dough rise for a long time, but recently I began experimenting with a dough that could be ready to go into the oven in under 30 minutes. This no rise pizza dough is fantastic. I’m truly surprised every time I make it and it turns out so well with such great texture and flavor. It is my new obsession. If you have the time and want to let it rise to develop more of those yeasty flavors, then you definitely can. But it isn’t absolutely necessary for this dough! Pizza dough is essentially a basic yeast bread dough. The makeup and ratios of the dough is very similar to many other flatbread doughs, as pizza essentially is a flatbread. All yeast breads start with 4 basic ingredients: water, flour, yeast, and salt. This easy pizza dough has just two more ingredients: sugar and oil. The sugar gives the yeast a little more food to feed on as well as adding just a touch of sweetness and the oil adds a bit of flavor as well as tenderness to the dough. If you are intimidated by working with yeast, this is a great place to start because this process is so simple and essentially fool proof. This simple pizza dough is very forgiving and you will be so surprised at how it becomes a fast favorite! This mixing method for this pizza dough is called “the straight dough method.” This means that all of the ingredients are mixed in one step. 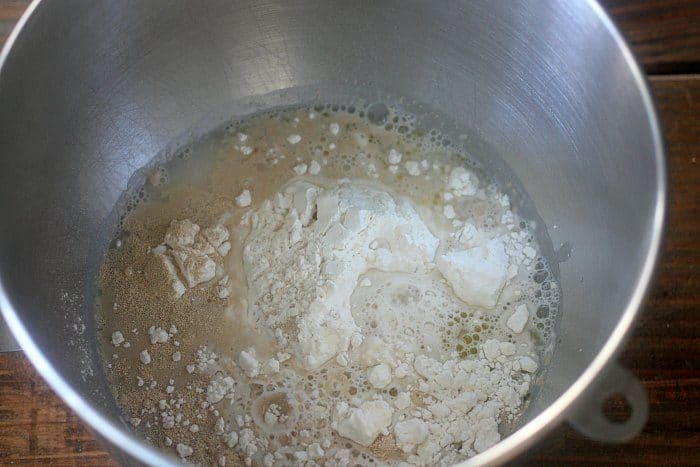 There is no need to dissolve your yeast or for multiple mixing steps. To use the straight dough method, combine all of the ingredients for the dough in the mixing bowl with a spoon or rubber spatula. Once all of the ingredients are mixed together, knead the dough. There are two methods that you can use to knead the dough for this pizza crust. If you have a stand mixer that has a dough hook attachment, then this can be used to knead the dough. If you are using this method, then you will knead the pizza dough in the mixer for just about 3 minutes until the dough is smooth and elastic. Alternatively, if you do not have a stand mixer with a dough hook then you can knead the dough by hand. This process is actually very simple. After all of the ingredients for the dough are all stirred together, turn the dough out onto a clean work surface. Using the heel of your hand, push the dough forward and then fold the dough over itself and push it forward again. You shouldn’t really need extra flour on your counter-top to do this. The dough will become less sticky as you knead it. You can watch the animation above to see what this basic kneading process looks like. If kneading by hand, this process will take about 5-6 minutes until the dough is smooth and elastic. One of the beautiful things about this dough is that you do not need to wait for it to rise. I specifically designed it to work well with just a short resting period after it is kneaded. The 10 minute resting period will allow the gluten strands to relax and will make it easier for you to shape out into a pizza crust. You can let it rest for longer if desired, and a longer resting period will develop a more complex yeast flavor. But this easy pizza dough tastes fantastic with just the short resting period and this is my new go-to way of using this dough. Note: This recipe calls for rapid rise or quick rise yeast which allows the dough to work well with only a short resting time. Active dry yeast can be substituted if that is what you have on hand, but the resting time will be slightly longer. See the recipe notes for instructions on using active dry yeast in this recipe. After the dough is rested you can shape it out into pizza crusts. This dough makes two 10″ or 12″ pizza crusts depending on how thin you shape your dough. To shape the dough, start by pressing down on the dough with your fingertips and press down on the dough to begin to flatten it. I like to then shape my dough by hand instead of with a rolling pin because not only is it easy and I don’t get my rolling pin dirty, but it is also fun! You can watch this tutorial to see how easy it is to stretch the pizza dough by hand. Alternatively, you can use a rolling pin if you prefer. 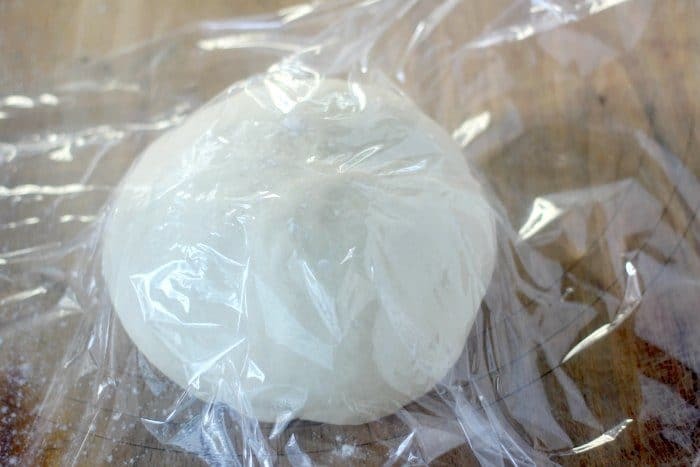 Note: If your dough is snapping back and is not holding its shape when being stretched, cover it with plastic wrap and allow it to rest for a few more minutes to relax the gluten strands. The absolute best way to mimic a wood fired oven pizza at home is to bake it on a preheated baking stone or baking steel. The technique is simple, you want to preheat your oven to the hottest possible setting. For my oven and most ovens that is 500F. If your oven can get hotter than that, then bonus for you! Wood fired ovens get upwards of 800 or 900F, so we want to get as close as possible. Your baking stone or baking steel should be in your oven while it is preheating for at least 30 minutes. This will ensure that all parts of your oven and the cooking surface are as screaming hot as possible to really char the crust. You want to put your pizza onto a surface that you can easily slide into the oven. If you have a pizza peel, that is perfect! But if you are like me and do not, you can put it on a piece of parchment paper that is either dusted with a bit of cornmeal or sprayed with some non-stick spray. I like the texture that the cornmeal gives to the bottom of the crust. I set the parchment on top of an upside down sheet pan or an un-rimmed baking sheet. This acts as my makeshift pizza peel. When you go to transfer the pizza into the oven, pull the oven rack out and gently slide the pizza onto the preheated surface. I like to keep it on the parchment paper so I can gently tug at the parchment to carefully slide it on. Don’t worry, even though most parchment papers are recommended for lower temperatures than 500F, there is no risk using it at this high of heat especially for a quick baking time. 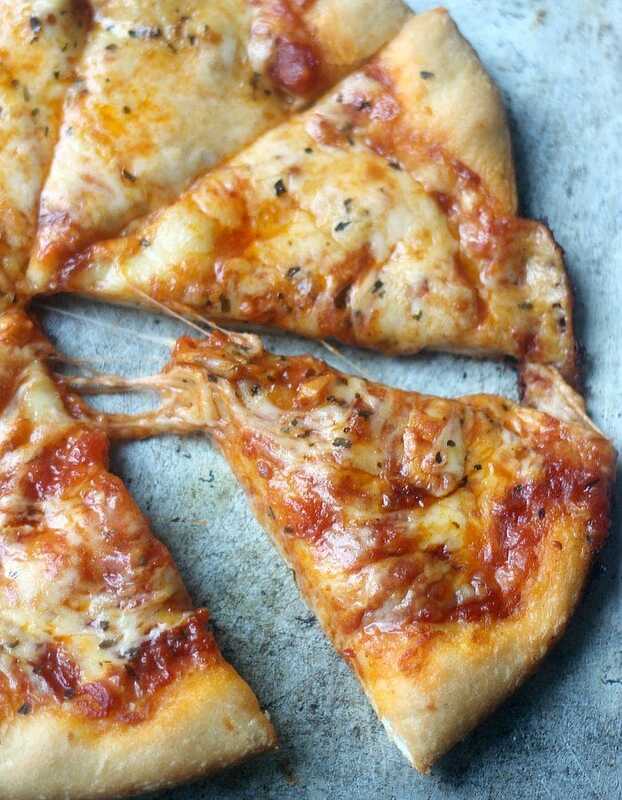 If you do not have a pizza stone or pizza peel then you can make a makeshift one by turning a sheet pan upside down and preheating this in the oven instead. Making a pan pizza in my cast iron skillet is my second favorite way to make pizza at home, behind the real baking stone pizzas. This method results in a pizza crust that is slightly thicker and fluffier than the baking stone crusts, but it also results in an impossibly crispy and almost fried bottom. It is pretty fantastic! To make a quick pan pizza, stretch the dough out to about the size of your cast iron skillet. Add about 1/4 cup oil to the pan. I know this sounds like a ton, but it is what really gives the crust that really crispy bottom. Place the dough into the pan and then put it on the stove top over high heat for about 3 minutes. All burners are different, so you can use a spatula to gently lift up on the crust to check the bottom to make sure it isn’t burning. This jump-starts the crispy bottom of the crust and also preheats the pan so the pizza doesn’t just steam in it once it goes into the oven. If you really love pan pizza and want a more over the top version, you should check out my Homemade Pan Pizza post. But this method also works really well for this quick and easy dough! Check the dates on your yeast: Yeast does expire and if it is too old it might not be active for your dough. Check the dates on your yeast to make sure it will work well for your dough. Use warm water, but not hot water: Yeast loves warm temperatures and grows most rapidly when it is warm. You want to use water at about 120F (43C) for the rapid rise yeast in this recipe. This should feel hotter than body temperature but not so hot that you can’t touch it. Measure your flour properly, using the spoon & level method: If measuring by volume instead of weight, make sure you use the proper method of lightly spooning the flour into your measuring cups, without packing it down, and level it off. The dough shouldn’t be dry, it will be slightly sticky at first and will get more smooth as it is kneaded. Try to avoid adding extra flour during kneading unless absolutely necessary. Preheat your oven before doing anything else: The very first thing you should do in your pizza prep is to preheat your oven. Even if it only takes 10 minutes for the oven to indicate that it has reached its highest temperature, you want to make sure that every part of the oven is screaming hot so the pizza will cook very quickly and get that beautiful crust. I know that is a lot of information for such an easy recipe. But you know me, I like to make sure every question you might have is answered! I do hope that you give this pizza dough a try and make homemade pizza night a tradition in your home! It is such a fun process! This easy pizza dough comes together in no time and is a "no rise" dough! 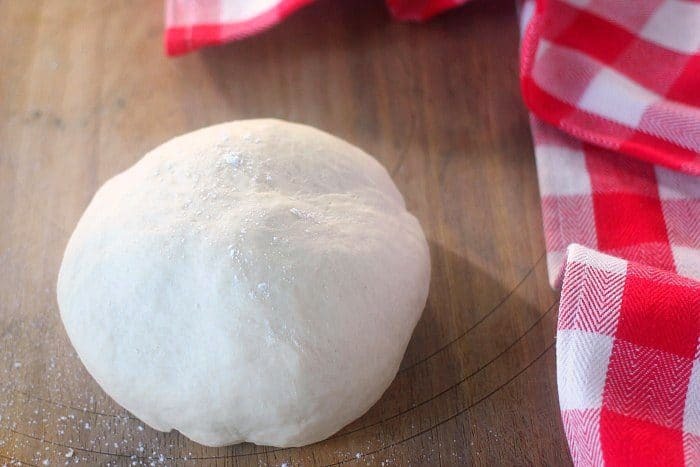 This basic pizza dough will become a fast family favorite for homemade pizza night! Prep your oven: Before starting any of your dough or pizza ingredient prep, preheat your oven to the hottest setting. This is 500F for most ovens. Position your oven rack on the lowest position in your oven. Place your baking stone, baking steel, or a sheet pan turned upside down on the lowest rack. OR if you want to make a pan pizza, you do not need to preheat a stone in the oven. Just put about 1/4 cup of oil in the bottom of your 10" or 12" cast iron skillet and set aside until your dough is read. Combine dough ingredients: Combine all of the ingredients for your pizza dough in a bowl with a spoon or rubber spatula. The ingredients can go in all at once, no need to hydrate your yeast separately. Stir until the ingredients are coming together. Knead the dough: If you have a stand mixer, knead the dough with a dough hook attachment at medium/high speed for about 3 minutes. Until the dough is smooth and elastic. If you do not have a stand mixer, knead the dough by hand on a clean work surface for about 5-6 minutes. Until the dough is smooth and elastic. Rest the dough: Divide the dough into two equal pieces. Place a piece of plastic wrap right on top of each piece of dough and let it rest for about 10-12 minutes. This will relax the gluten structure and make it easier to stretch out. You can rest the dough for up to 1 hour at room temperature before shaping the dough. It will develop more yeast flavor with a longer resting time. Stretch the dough: Using your finger, press down on the dough to press it down into a circular shape. Continue stretching the dough until it is about 10" 0r 12" in width. Alternatively, you can use a rolling pin. If the dough is snapping back and not holding its shape, cover it with plastic wrap and let it rest for a few more minutes. 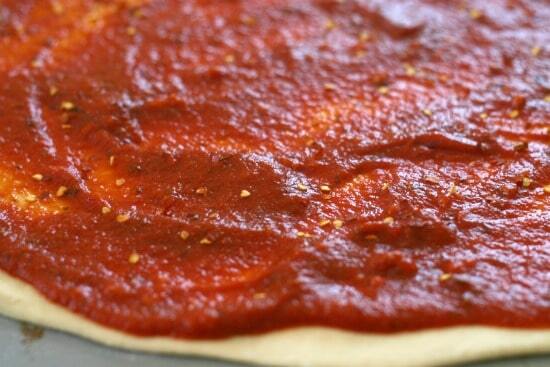 Top the dough: If using a pizza peel, top the peel with a little bit of cornmeal and place your dough on top of it. If you do not have a pizza peel, place the dough onto a piece of parchment paper that has been lightly sprayed with some oil or topped with a bit of cornmeal. 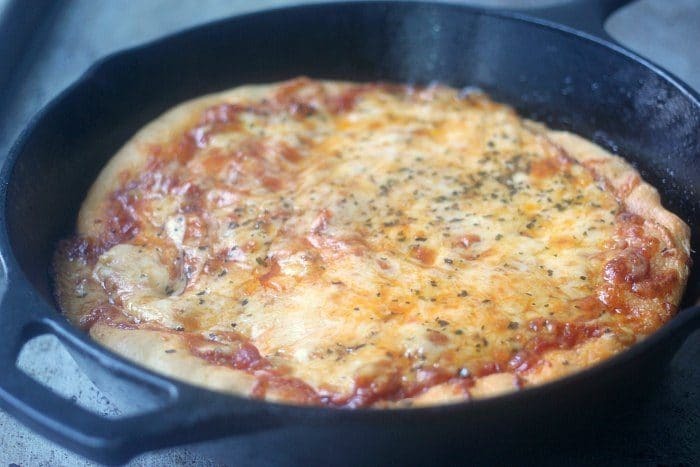 OR if you are making a pan pizza, place it into the oiled cast iron skillet. Top your dough with sauce and toppings. 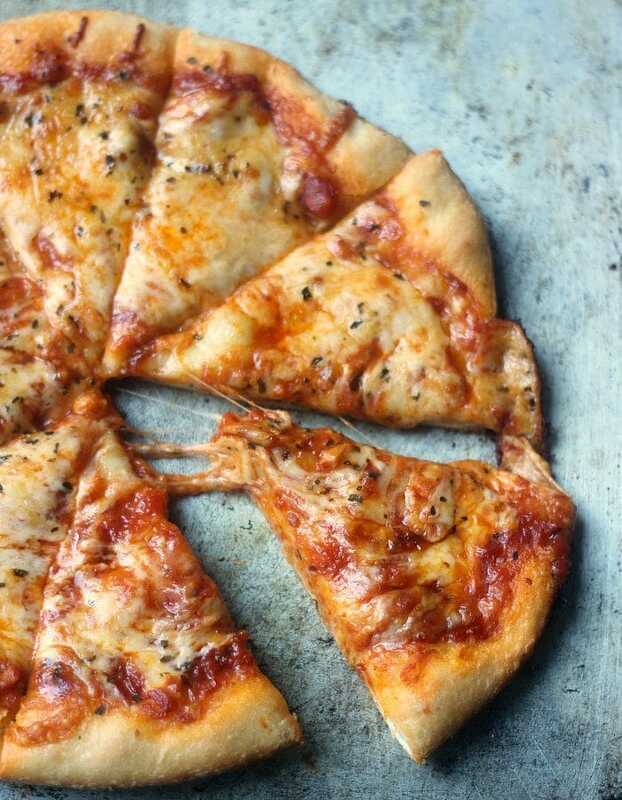 Bake the Pizza: Carefully transfer the pizza onto the preheated baking stone, baking steel, or sheet pan OR if making a pan pizza, place it over high heat on your stove top for 3 minutes and then transfer it to the oven. Bake for about 10-12 minutes, until the crust is crispy and the toppings are starting to char slightly. All ovens are different so keep a close eye on your pizza. If you want to make gluten free pizza dough: I recommend using a gluten free blend if you want to make this crust gluten free. I have tested it with good results with Bob's Red Mill's gluten free flour baking blend. Also note that some quick rise and rapid rise yeasts do contain wheat in them. Check the labels of your yeast. If you want to use active dry yeast: Substitute equal amounts of active dry yeast for the rapid rise yeast. Let the dough rest for 30 minutes minimum before shaping your dough. The dough can rest for up to 2 hours with active dry yeast and more yeast flavor will develop with a longer resting time. And now I know what I’m making for dinner the night after the other comment I made about knowing what I’m going to make for dinner. Thanks for the inspiration tonight Baker Bettie! I had a whole lot of nothing in the pantry/refrigerator when I came across this recipe. I substituted bacon for sausage in the “Sausage, Onion, and Cream Cheese Pizza” and it was delicious! I was very pleased to take what looked like it couldn’t possibly be enough to feed two and create a very tasty dinner from my boyfriend and I. So glad I could help you out! Did you put cream cheese on it? That is my favorite part. It is sooo good! Baker Bettie, I love all of your recipes! I am a novice Baker who was always convinced that he couldn’t bake. I got brave one day and tried your simple drop biscuit recipe with astonishingly good results! Now I am methodically learning new recipes and executing them successfully every time! I very much appreciate that you take the time to explain how and why the ingredients interact…understanding the science of baking takes the mystery out of it and gives me a lot of confidence. Thank you. This recipe didn’t work for me at all. Pizza came out gooie no matter how long it stayed in the oven. Never browned either, just burned. I was really excited for the recipe but I just wasted an entire day. Next time I won’t try to take short cuts and will make pizza the proper way. Hi there! So sorry to hear that you had issues with this pizza crust. Truthfully, this is a standard basic pizza crust recipe. It isn’t a shortcut, you just can take much longer to make pizza dough for more developed flavor. Can I ask how thick you rolled out the dough and if you used toppings with a lot of moisture in them? I’d love to help you troubleshoot! I DON’T SEE NOTE UNDER STEP 2 ; OR ANY ASTERISK INDICATING A NOTE ELSEWHERE. #2. Combine dough ingredients: Combine all of the ingredients for your pizza dough in a bowl with a spoon or rubber spatula. The ingredients can go in all at once, no need to hydrate your yeast separately. Stir until the ingredients are coming together. Hi there! Thank you for bringing this to my attention. My site went through some updates recently and some of the notes did not transfer over. I have updated the recipe to include the notes. They are located at the very bottom of the recipe. “If you want to use active dry yeast: Substitute equal amounts of active dry yeast for the rapid rise yeast. Let the dough rest for 30 minutes minimum before shaping your dough. The dough can rest for up to 2 hours with active dry yeast and more yeast flavor will develop with a longer resting time.” Hope that is helpful! Does this dough work well on a grill? Hi Debbie, I have never tried that but I don’t see why it wouldn’t!